Chances are good that your air conditioner is inefficient and oversized if it is more than 10 years old. You can probably improve comfort, lower energy bills and reduce your environmental impact by replacing an old air conditioner. You should consider replacing your air conditioning system if it is noisy or no longer cooling evenly. If your home is humid, your system may be inefficiently oversized or no longer working adequately. These problems could require major repairs that approach the cost of a new unit, particularly when you consider your potential savings on energy bills. To estimate your potential savings, look for the SEER (Seasonal Energy Efficiency Ratio) number on your current AC unit. If it is 10 or below, definitely consider replacement. The difference in annual operating cost between SEER 10 and SEER 13 air conditioners is substantial. Though costs vary widely, the average family in Florida can expect to pay $722 per year to cool a home with an air conditioner rated at SEER 10. The same family could spend $559, or $163 less, for a season of cooling with a SEER 13 air conditioner. Jumping up to SEER 18 would bring another $100 in savings. 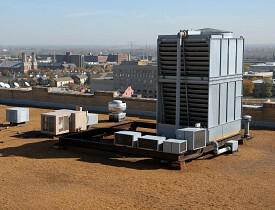 Of course, the high cost of replacing the air conditioner is the major hindrance. High-efficiency systems with SEER ratings above 16 generally cost at least $3,500, but the full project could cost much more. To maximize efficiency, air conditioners should probably be replaced at the same time as the furnace. The heating and cooling systems typically share a blower motor, and an old, inefficient motor will reduce the efficiency of the new air conditioner.